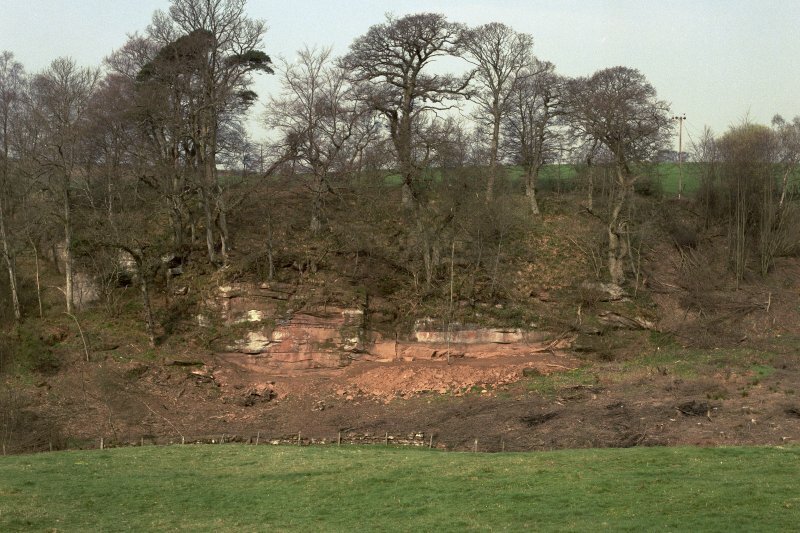 General view of the Ballochmyle outcrop, taken from the south-east. Ballochmyle. Detail of the north-east panel. General view of the south-west panel at Ballochmyle. Ballochmyle. Detail of the south-west cup-marked panel. Elevation of cup and ring sculptured rock face. Ballochmyle. Ringed stars situated between the two main panels. 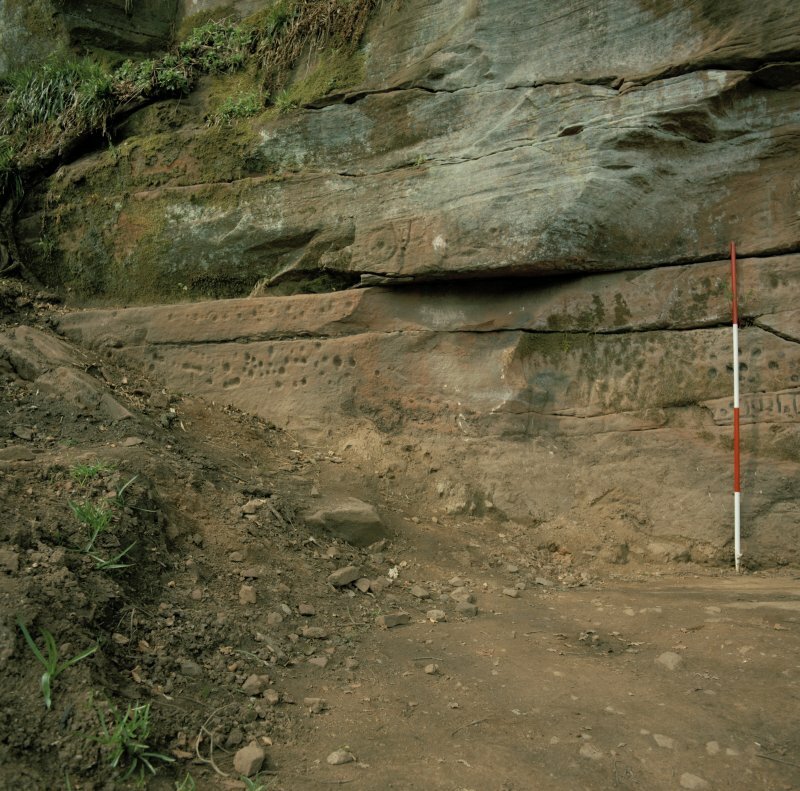 General view of the north-east panel at Ballochmyle. 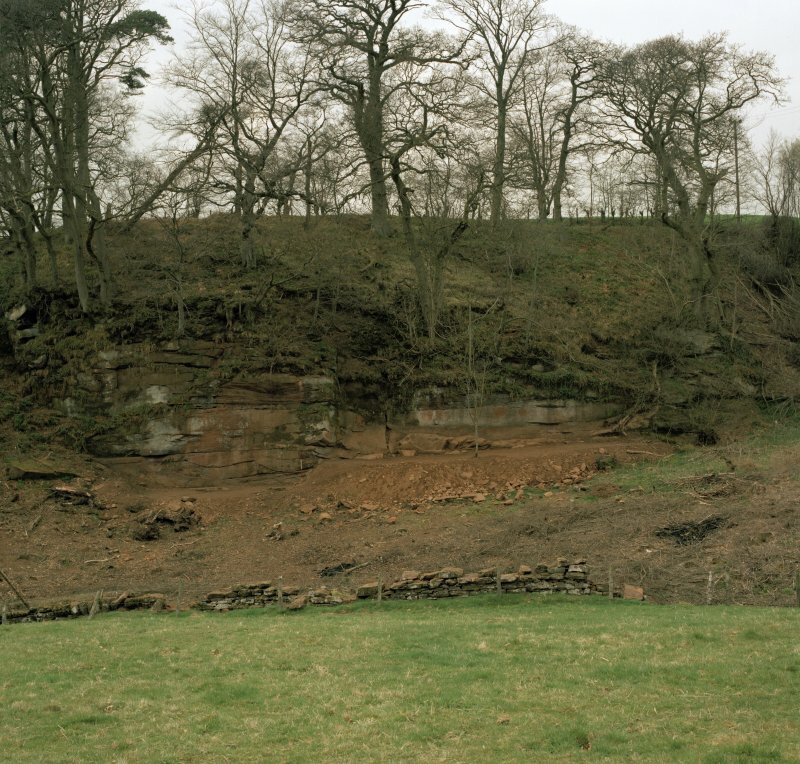 General view of Ballochmyle outcrop from the south east. Ballochmyle. Detail of the area of carving situated between the two main panels. Ballochmyle, detail of the south-west panel. Ballochmyle, view of the south-west panels. Detail of the Ballochmyle cup and ring marked rock. 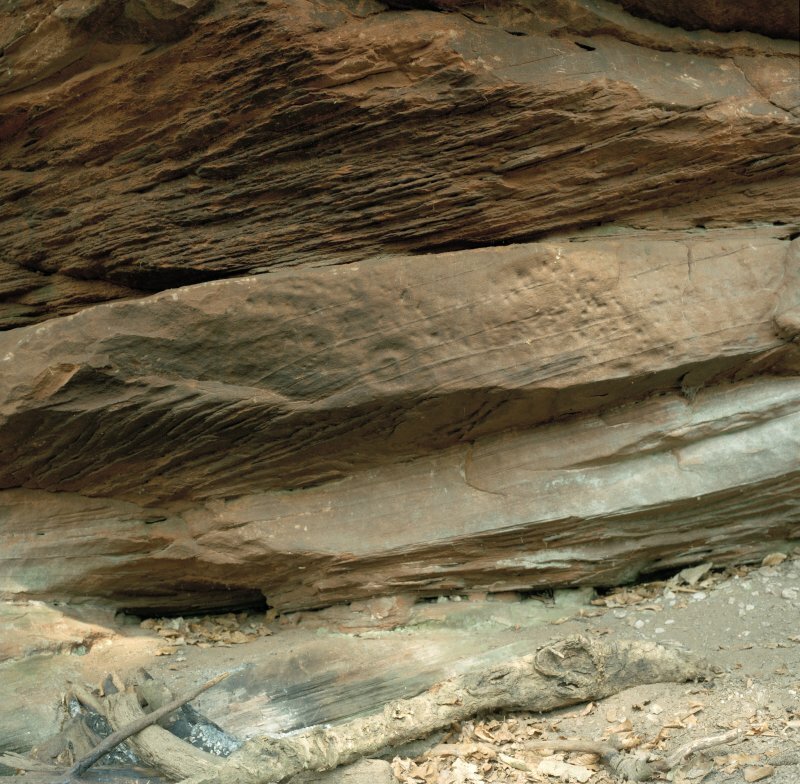 Many cup-and-ring marks on face of cliff. 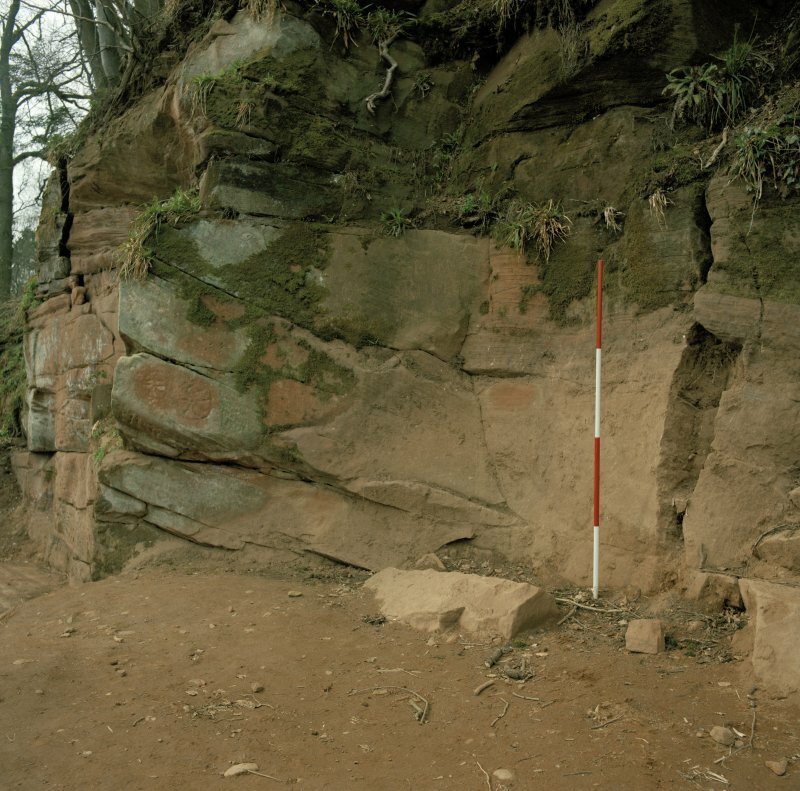 There are two large groups of cup-and-ring markings on a vertical sandstone rockface situated some 260m NE of Ballochmyle Viaduct. 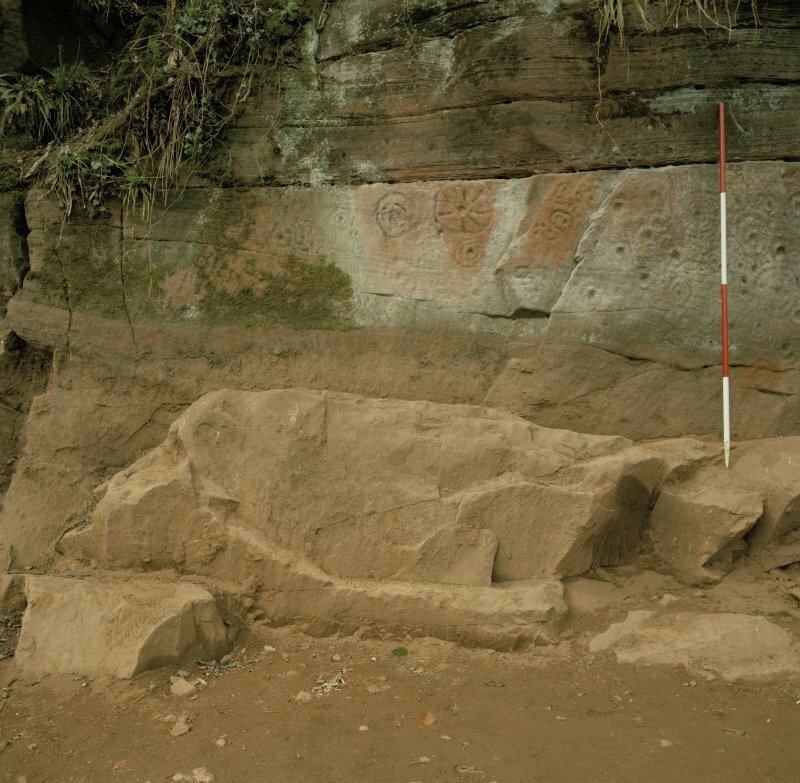 By removing several feet of soil from the base of the corner that lies between the two main halves of this site a further 3 'trilithon-like' glyphs were revealed, to add to the large site total. The Ballochmyle cup-and-ring markings were recorded by RCAHMS in early 1987 at the request of Historic Scotland. The drawing was undertaken by Ian Scott and John Stevenson and the photography by Geoffrey Quick. 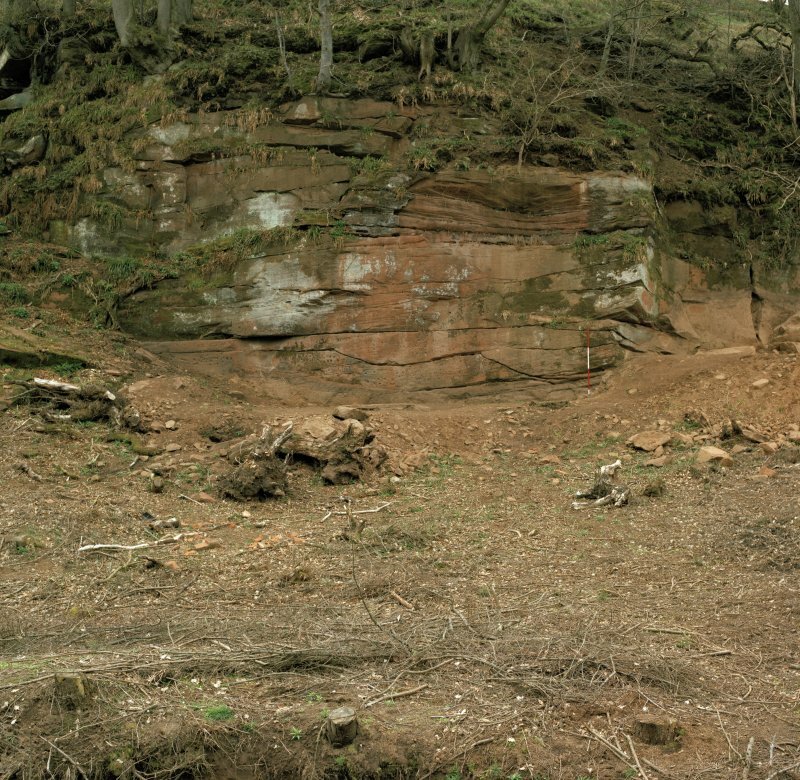 A short note describing the rockface was published by Jack Stevenson in 1994. 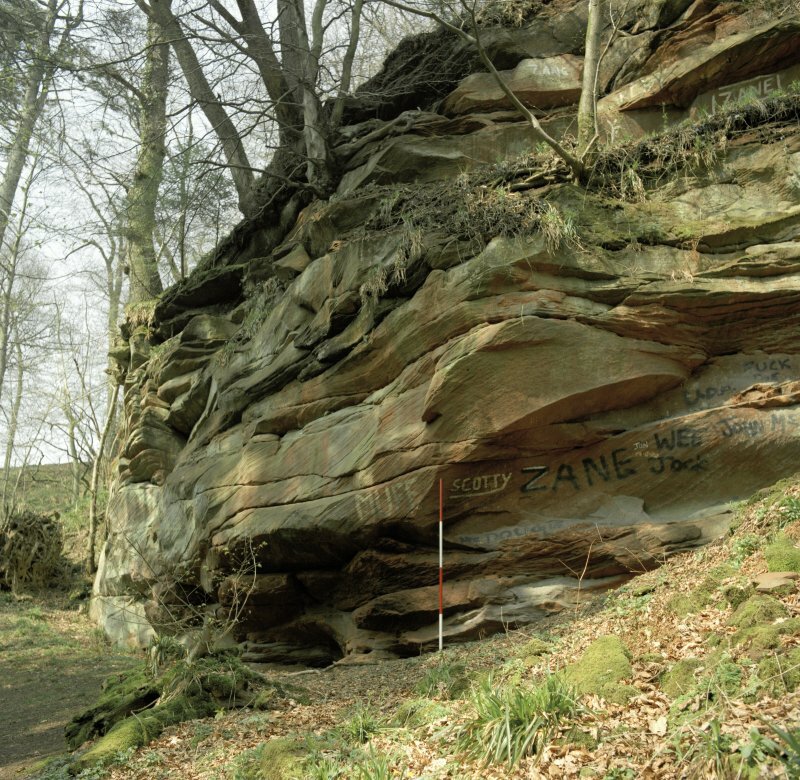 NS 5107 2552 A 3D laser scanning and high-resolution photogrammetrical survey of the extensive cup- and ring-marked outcrop at Ballochmyle was undertaken on 28 April 2015. High resolution geometric meshes were created and integrated with existing traditional hand-drawn illustrations to provide new visualisations of the carvings. A series of analytical techniques were also employed to produce colour coded and shaded views of the carved surfaces. 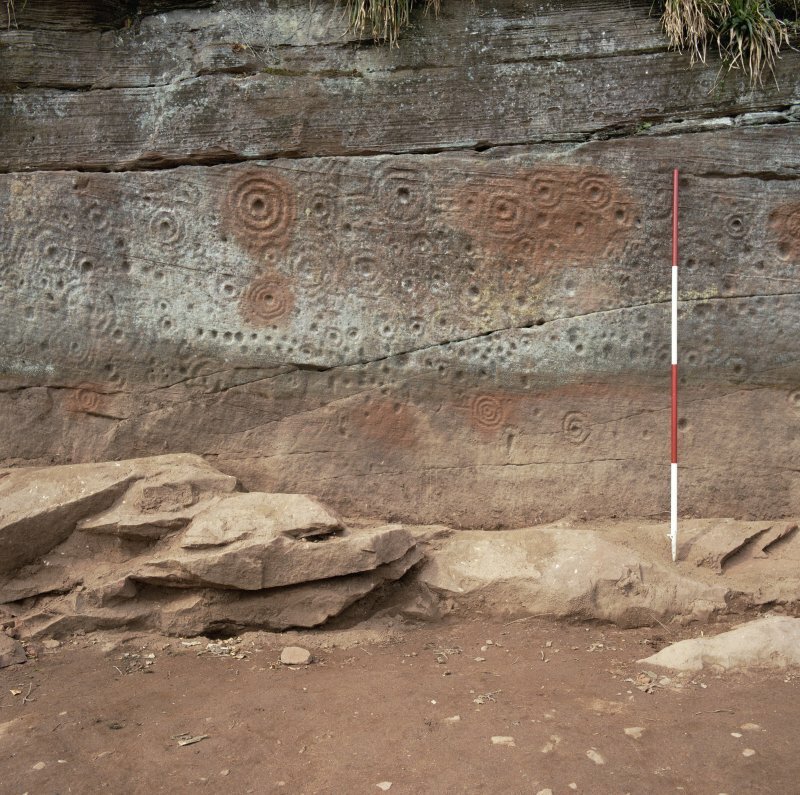 Cup and ring markings consist of circular carved indentations on to rock faces. The cup is sometimes surrounded by a groove called a ring. Some have a groove that travels from the centre to the edge. The term ‘cup and ring’ can be a little misleading, as it also serves as a short-hand for other types of shape, such as spirals, lines, dots and concentric circles. They are commonly associated with the late Neolithic and Bronze Age. Shapes like this can be found throughout Britain and Atlantic Europe. There are examples on the Clava Cairms near Inverness, at Kilmartin Glen and at Weetwood Moor in Northumberland. They also crop up in Mexico, India and Australia. 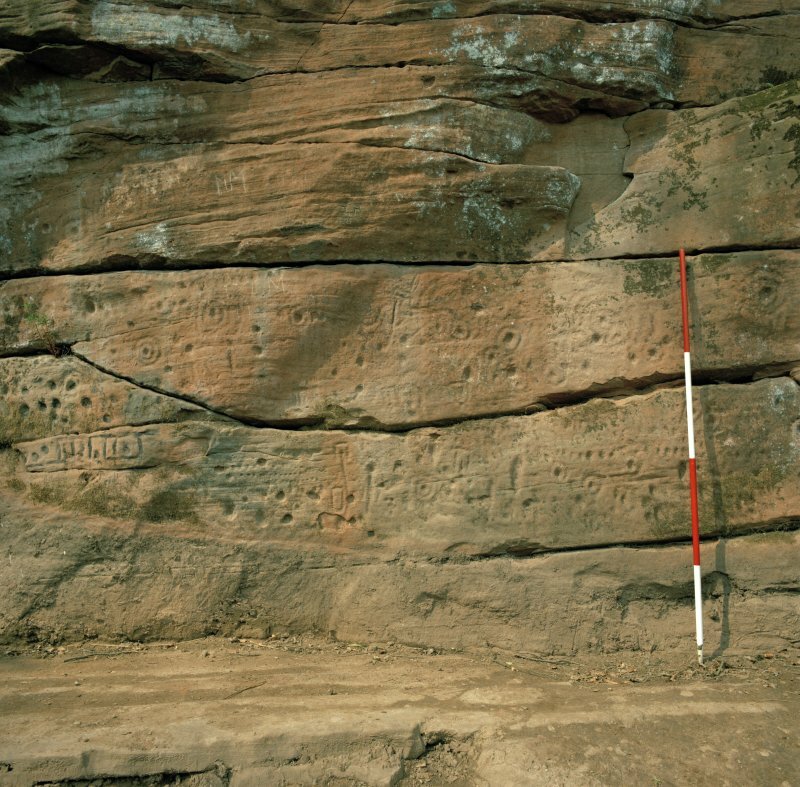 The Ballochmyle shapes are carved into a large, vertical red sandstone rock face in a deep river valley, in two defined panels. According to research carried out shortly after their unveiling in the 1980s, the carvings fall into three phases. 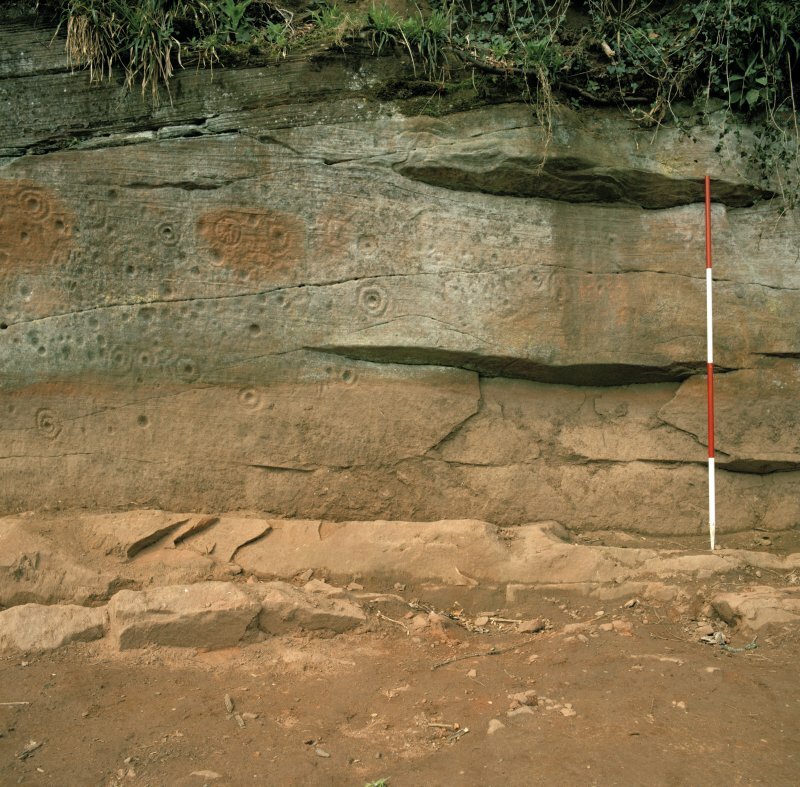 The main phase is Neolithic and includes: cup and ring marks, both together and separate; ringed stars; stars inside squares and simple grooves. There are also two figures that might be deer. The quality of the carving is variable; some are finely executed while others are cruder, suggesting more than one hand. 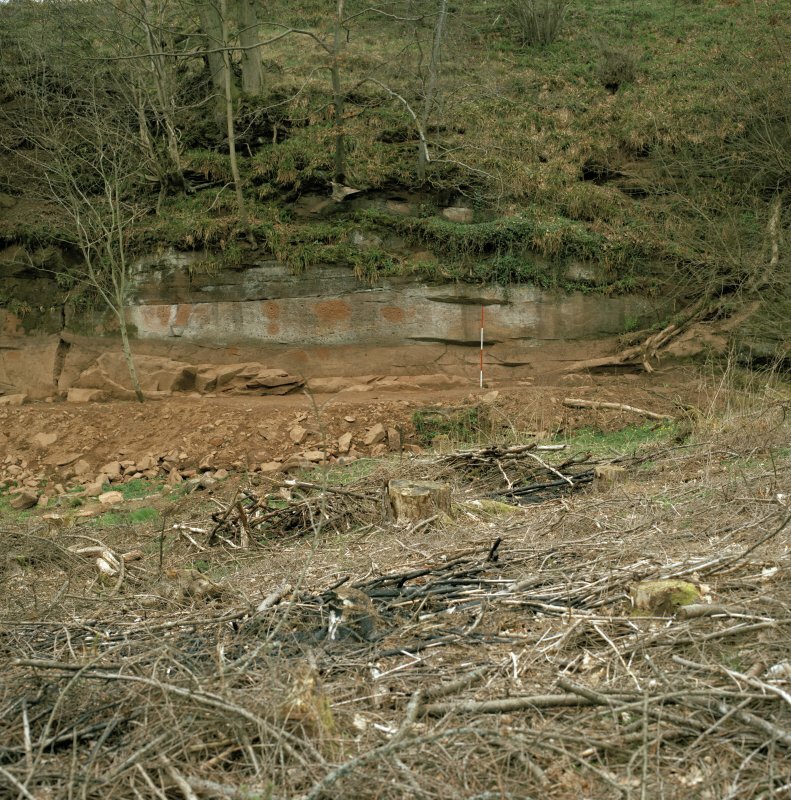 Early investigation suggests that the site was used and added to over many years. Another later addition are some possibly medieval letters in relief spelling the end of a word, ‘—ASAID’. A final addition to the carvings is the inscription of the date, 1751. If this was actually carved in 1751 it’s unusual there are no records about the site in eighteenth century literature. There is however a coincidental reference in an American academic paper from 1891, that the date of the first ever printed report of cup-marks was in a historical work about the province of Brandenberg, dated 1751. 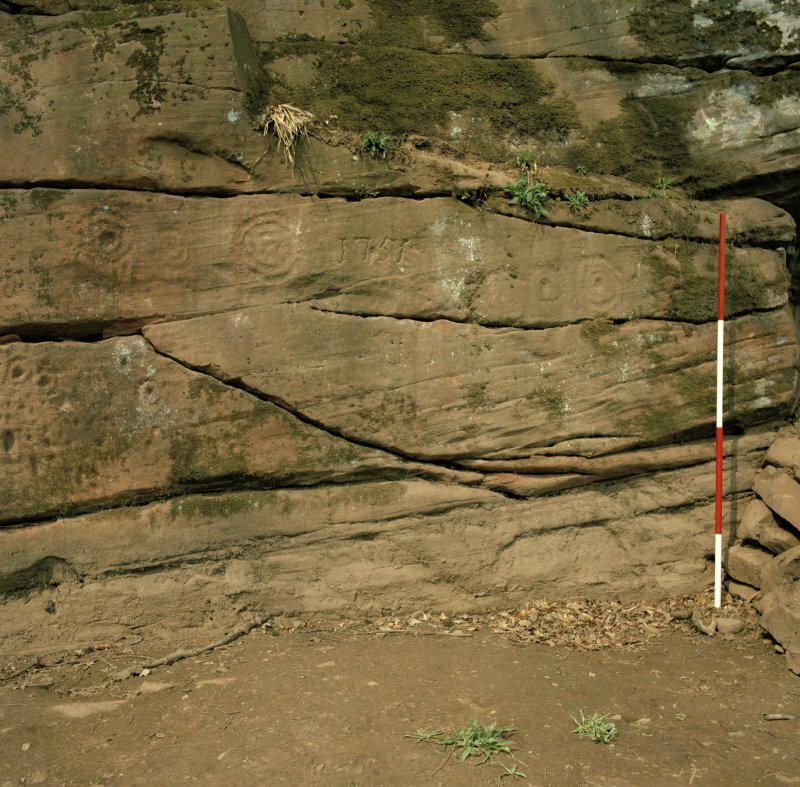 The Ballochmyle markings are unusual because they are carved into a vertical rock face. 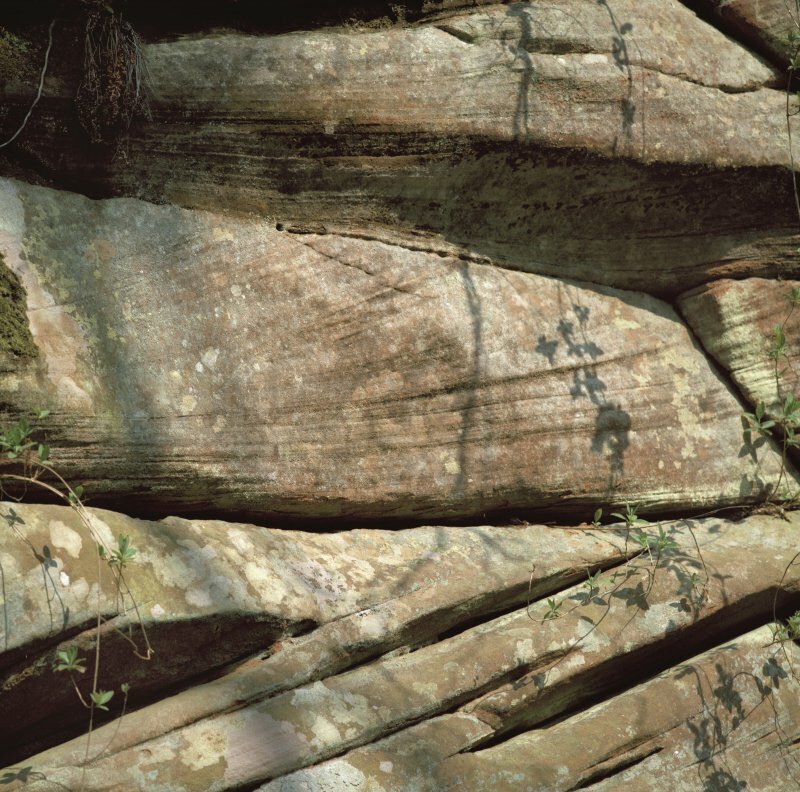 Most other similar marks are on flat or slightly sloping surfaces, although there are known standing stones and cave interiors which have been decorated with such symbols. Language, art or something else? So, what are these carvings? 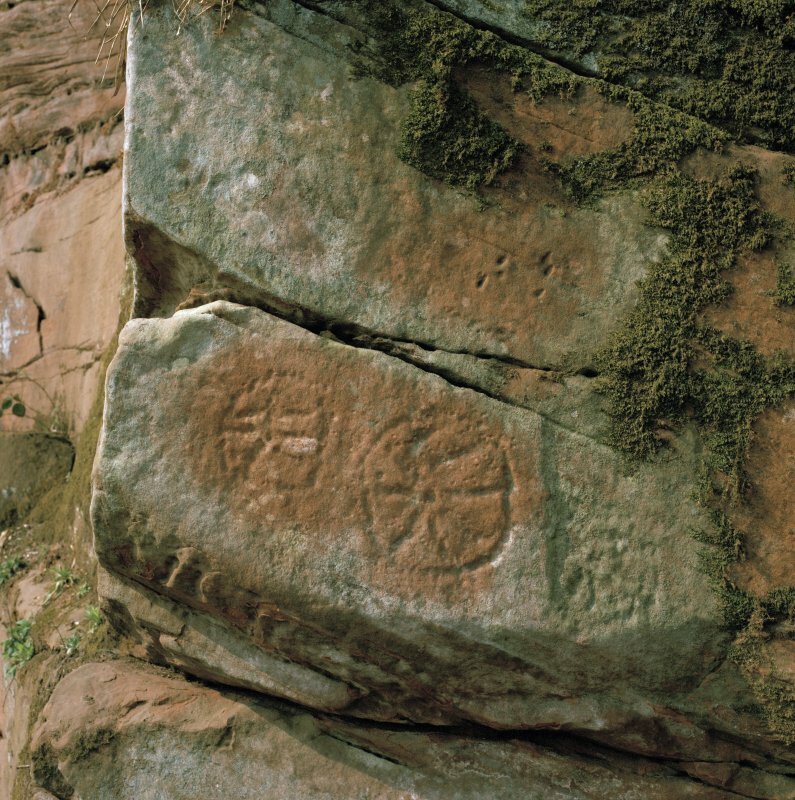 Why does a cup and ring mark in Ayrshire look identical to a group on a rock in Carschenna in Switzerland? Perhaps Atlantic trade routes could explain the transport of imagery and art. Another theory is that they might be language, however this hypothesis doesn’t seem to have taken hold, and some archaeologists believe the relatively uniform sizes and shapes are simply a product of measuring using hand-widths and lengths. They may mark special spots, such as watering holes. This is a particularly attractive idea as the concentric circles mimic the shape of ripples in water after the impact of a stone. They also might indicate a hunting ground, and the deer pictured on the first phase of carving could be a connection to this theory. Why are the carvings vertical? 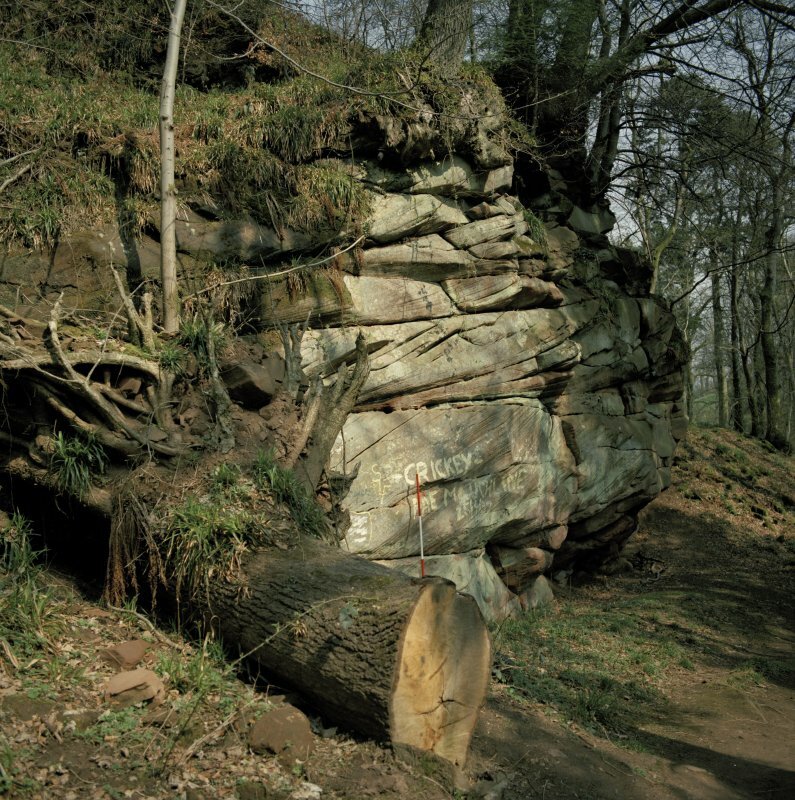 The colour of the rock and likely cover of trees at the time means they probably couldn’t be seen from a distance, but carvings on a vertical face are much easier to see at close range than those on a horizontal one. Maybe each person who visited the spot made their own carving, giving the effect of a memory-wall much like modern-day commemorative walls covered in photographs. 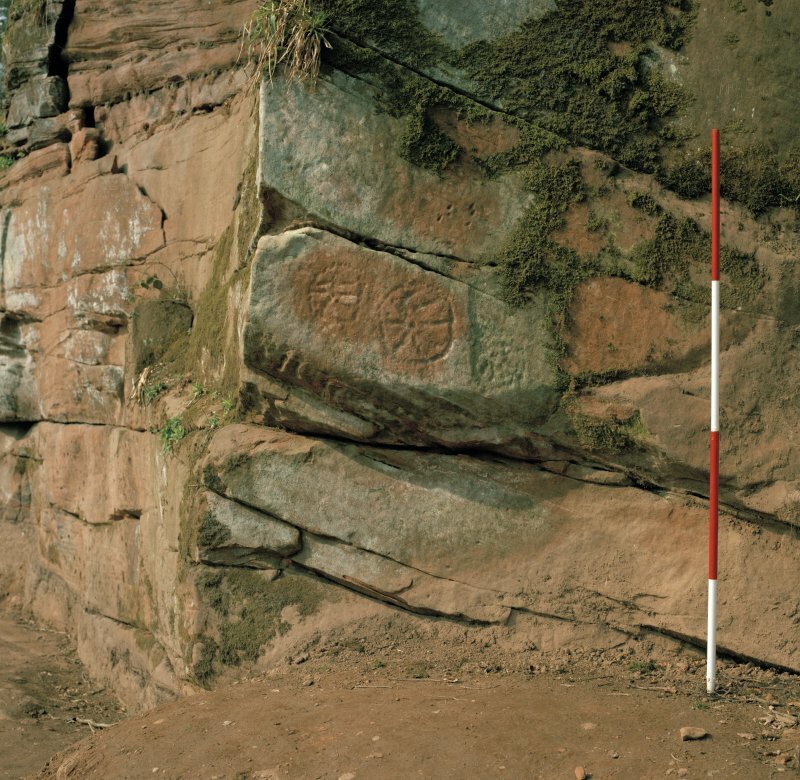 A new rock-art study, funded by the AHRC, will soon begin at Historic Environment Scotland: perhaps it will shed more light on the mysteries of Ballochmyle.